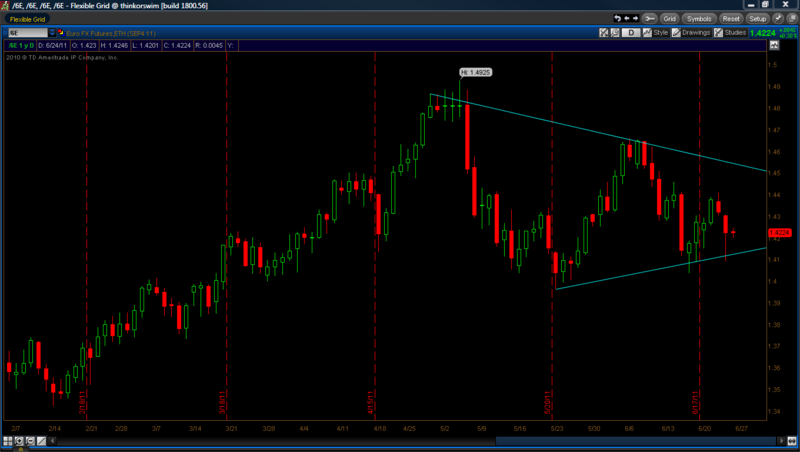 The euro is forming a large wedge, or triangle pattern on the daily charts. As price gets closer and closer to the apex more pressure will build and an explosion of price action will result. Position yourself accordingly. Click the link for more info on price patterns. The Hanging Man Reversal is a common candlestick pattern we see near the end of a rally. The psychology behind the pattern is simply, retail traders or “late to the party charlies” want to get a piece of the action, but the majority of the move has already happened. If the following day closes below the hanging man’s close, all the bulls who went long on the hanging man’s close are now underwater in their positions and selling occurs. In order for this pattern to confirm a reversal we need a close the following day below the hanging man’s close. Monday’s SPY chart produced a candlestick pattern called the hanging man. This is a bearish pattern. To some, Monday’s candle may look like a hammer (a bullish signal), it is the positioning of the candle (at the top of the rally) that makes it a bearish pattern. The hanging man alone does not initiate a sell or short signal. Tuesday’s price action, closing below the body of Monday does however confirm this bear signal (see the write-up on candlesticks). While the past two weeks have produced light volume, we have a potential pullback to the prior resistance (now new support). If we are to make a new high this pattern would have failed, therefore our stop would be placed just above the highs for short positions. The Japanese Candlestick charting technique is one of the most useful tools for spotting these price patterns and trends. Here is a technical swing trading strategy which analyses key support and resistant levels for entry and exit of our trades. Price patterns are created using support and resistance levels and help give us a clearer understanding of what’s going on in the stock. Support and resistance are like the floor and ceiling of a room. Support being the floor, resistance the ceiling. Entering as close to these levels as possible allows for the least amount of risk to be taken on during the trade. 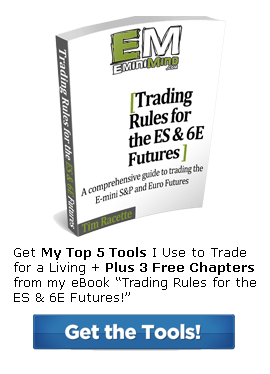 These are both psychological and technical price levels that will help you get the most out of every trade! Before defining the patterns, we must discuss what it means to be in a trend. While quite subjective to interpretation, an uptrend is a series of higher highs and higher lows and a downtrend is a series of lower highs and lower lows. We will discuss the most common price patterns below. When looking at price patterns, there are two categories they are divided into, continuation patterns and reversal patterns. The price patterns discussed here can be used across any timeframe, although historically the longer the time frame the more accurate. Here are a few of the most common price patterns. Let’s go through the price patterns one by one and look at the features that make up the pattern. The ascending triangle is identified by its relatively flat upper resistance boundary and rising lower boundary. The upper boundary should be touched 2-3 times in order for it to be an actionable triangle. This pattern is a bullish continuation where the bulls are showing strength and the bears are finding it hard to drive prices lower. A target price is gauged using the different in price from the flat ceiling and low point of the triangle. With a ceiling of $31 and low of $24, a 6 point price target can be estimated from the break of the resistance level. The descending triangle is a bearish continuation pattern with a chart mirroring the ascending triangle to the downside. While triangles are classified as continuation patterns, they can be reversal patterns if occurring in the context of the opposite trend. (ie: descending triangle in an uptrend, or ascending triangle in a downtrend). The bull flag formation is a bullish continuation pattern which usually follows a breakout and is now consolidating before making its next move higher. During this consolidation, prices should not retrace more than 50% of the flag “pole.” A Fibonacci Retracement can be used to accurately measure these levels. Typically the consolidation period will consist of lower volume, once volume increases that is usually a sign of the next breakout. The bear flag formation is a bearish continuation pattern where the underlying experiences a sharp drop in price then consolidates or chops sideways before its next move lower. The head and shoulders formation is comprised of a small rally, large rally, and another small rally, usually occurring at the top of an uptrend. This forms two shoulders and a head. The neckline is the support level at which the stock rallies and pulls back to. When a rally sells off before making a new high, it is a sign that a head and shoulders pattern is forming. The target price can be estimated by taking the different of the high and low of the pattern and projecting it down from the neckline. The inverted head and shoulders pattern is the opposite of the head and shoulders pattern, it is a bullish reversal pattern. The head in this case usually acts as the bottom of a downtrend and is often times in the form of an inverted hammer. Once the neckline is broken with increasing volume a move to the upside should follow.